The class with Senō sensei was as impressive and precise as always. With micro details such as rotating the bones of the forearm, and folding the wrist slightly during the uke nagashi, we are able to take Uke’s balance before he could feel it. I could write about it, but it will never describe the beauty of his taijutsu. The best is to come here and to train. What I want to write about today is about one thing Senō sensei’s commented before the end of the training session. At the end of his class, Senō sensei spoke about the meaning of the kanji for Shinobi. Honestly, I didn’t get everything (I still don’t speak Japanese), but what I got, made me think about the many hidden meanings of this kanji. I would like to share my thoughts with you. Everyone in the Bujinkan knows that Shinobi is composed of 2 kanji: sword (Tō) above heart/spirit (kokoro). (1)(2)(3) So nothing new there. So, to me, what was new in the way Senō sensei explained it is that he said that “the blade is hidden in the heart/spirit”. The usual and common understanding is that we must “have a spirit as sharp as a sword”. This is why Senō sensei’s interpretation acted as an eye opener. What I understood is that, linked to what Hatsumi sensei said the day before, we have to hide our intention, and be ready to terminate the opponent when the occasion arises. A Waza is intention, this is why there can be no waza in a real fight. A waza by definition is a drilled exercise repeated thousands of times until it is ingrained in our mind / body. (4) To get this level of ability, one must repeat his basics during many hours, months, and years. At some point, there is no thinking, only a natural movement. This is what you did when you learned to ride a bike, or when you learned to swim. Even if you don’t do it regularly you can ride a bike, or swim the minute you do it again. When you have acquired this ingrained state, the mind / body reacts and the only thing you do is to witness what is happening. You’re not actor, but spectator of your actions. In a real fight, you have no time to think. Thinking is possible only when you train. When you fight it is to late. If your basics are bad because you didn’t spend enough time studying the tenchijin and the fighting systems of the Bujinkan, you will never be able to adapt your taijutsu to the situation. On the contrary, if you did your homework, your mind / body will slash the opponent naturally. When you put intention in your movements, it is because of a lack of mastery of the basics of the Bujinkan. 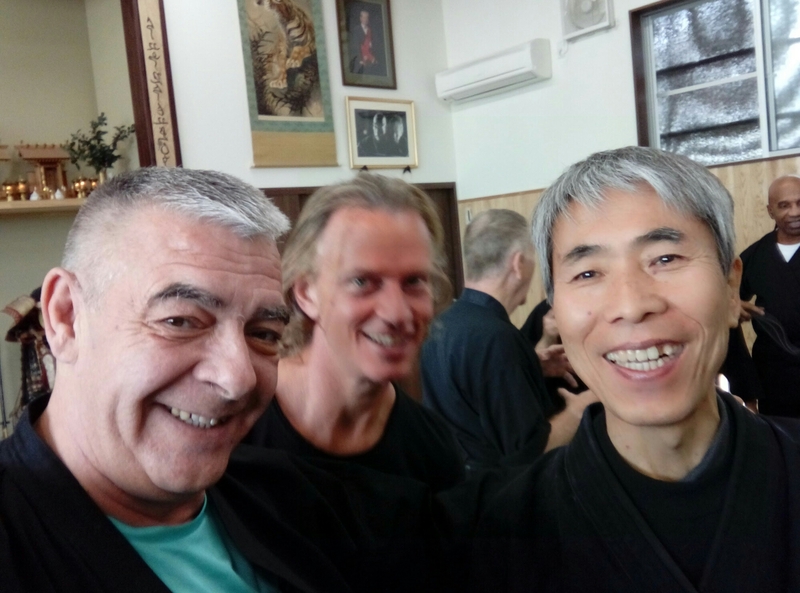 Many dōjō are developing a mix martial art approach of the Bujinkan, instead of respecting Hatsumi sensei’s path of the natural movement because of these weak basics. In sport, nothing is natural, it is mechanical. When the sword is hidden in the heart/spirit there is no sword visible, and therefore there is no intention. And because there is no intention, only the heart / spirit remains. “be slow and relaxed” said Sensei on Sunday, “and the movement will reveal itself”. The sword but visible, only the kokoro is there. Maybe this is why Takamatsu Sensei wrote about “kokoro no Budō”, the heart /spirit of Budō. Next Saturday we celebrate Takamatsu sensei’s memory. Please think about it. 4. I use “mind / body” as being one and not two. There is no duality. Inyō is unity. Sidenote: For those wondering. Stephen Hayes, moving away from the Bujinkan, called his system Tōshindō (sword+heart+path = Shinobi path). But that has nothing to do with the bujinkan. Next Post Yoko Or Jûji Aruki? Nice talk! Being natural is one of the most difficult things for us westerners.